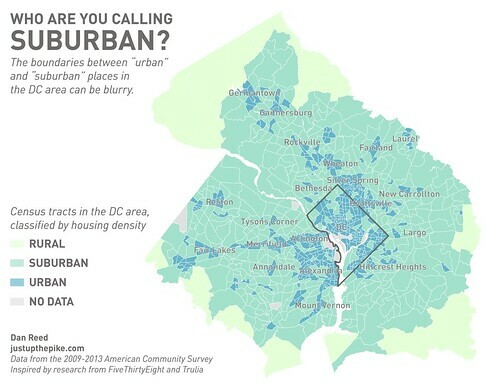 just up the pike: this map shows which parts of the DC area are really "urban" and "suburban"
this map shows which parts of the DC area are really "urban" and "suburban"
Where does "the city" start and end? Some might say it's the District line. But in reality, the lines between "city" and "suburb" are more unclear than you think. "Urban" (blue) and "suburban" (green) parts of the DC area based on housing density. Map by the author. Click for a high-resolution version. I got into an argument with someone at a happy hour a few years ago. Why? This dude said I lived in the suburbs, because Silver Spring was outside the District. Even if I was literally 1000 feet from Eastern Avenue. Many people would say the same: DC is "the city," and everything else is "the suburbs." But as our region grows and changes, the lines between "city" and "suburb" can get kind of blurry. "Urban" and "suburban" are about "what," not "where"
What makes a place "urban" or "suburban" isn't just whether it sits on one side of a municipal boundary or another. The distinction is about physical characteristics, like population density, the mix of uses, and how it's laid out. More often than not, urban places are older, built at a time when driving was less prevalent and places needed to support walking and transit use. As a result there are places like Alexandria or Silver Spring that feel urban but happen to sit outside the District or even predate its founding. Meanwhile, there are parts of the District that were built more recently and feel very suburban, like Fort Lincoln in Northeast. "It turns out that many cities' legal boundaries line up poorly with what local residents perceive as urban," wrote Jed Kolko, chief economist at Trulia, in a blog post a few months ago on FiveThirtyEight looking at how "suburban" some American cities are. So how can you determine whether where the "urban" parts of a city or region really are? Kolko started by simply surveying people about whether they felt they lived in a rural, suburban, or urban place. He discovered that the housing density had a big impact on how residents saw where they lived. Kolko found that at a density of 2213 households per square mile, people started to say they lived in an urban place. That's about the density of Falls Church. Below 102 households per square mile, they reported living in a rural place. Taking a few other data points into account, Kolko mapped several American cities and found that what many considered "the city" was actually really suburban, and vice versa. He didn't map the DC area, however. We don't have the complete model he used, but I was able to map the region's Census tracts based on household density. Looking at the map, you can see a huge swath of blue in the District, representing areas with urban household densities. But that blue area hops across the Potomac River into Virginia, covering most of Arlington and Alexandria. It also extends into Maryland, encompassing Silver Spring, Takoma Park, and Hyattsville. Beyond that, there are urban "clusters" outside the Beltway, in places like Wheaton and Rockville in Maryland and Merrifield and Reston in Virginia. Many of them overlap with Chris Leinberger's map of "Walkable urban places" or WalkUPs. Meanwhile, the District has a fair share of "suburban" areas, like Palisades, Foxhall, and Crestwood in Northwest, Deanwood in the Northeast, and Bellevue in Southwest. Of course, this is just a map of housing density, which doesn't really say anything about urban form: places that aren't just dense, but have a street grid that makes it easy to walk and a mix of housing, shops, and other uses. Some of the urban places outside the District have those things. Others, like Fairland in eastern Montgomery County, have the population density but are really just dense suburbs, designed for driving and lots of it. What else do you see in this map? This is a very interesting map! Looking at it, I see the legacy of 1) older communities, 2) existing municipalities in the counties, 3) older transit systems (e.g. trolleys) 4) the wedges and corridors plan in Montgomery County, and 5) the effects of Metro and densification near Metro stops. The terms "urban" and "suburban," are convenient terms we use as shorthand, but as you point out, the images or assumptions that come to mind may not reflect reality. Both my parents grew up in New York City, but my father always lived in an apartment, while my mother lived in a single-family house. Many different living, working and playing options are available in our region, but preferences, the increasing population, demographic changes, job location, cost of housing and transportation issues are factors that taken together, are leading to denser land uses. In Britain, the high petrol tax and the difficulty in obtaining permission to develop agricultural land has meant that people tend to live and work in more compact urban places surrounded by rural land. Their countryside in metropolitan areas is much better preserved than it is here. There are places in Britain that Americans would recognize as more suburban, but they're definitely less common than here. One change that's happening now and likely to increase in the future is telecommuting. Many organizations large and small are shrinking their office space. Some of their employees prefer to work from home, but others are expected to whether they like it or not. Telecommuting may reduce travel demand; on the other hand, some folks may still get in their cars to work from the nearest library or coffeeshop. The shrinking demand for office space and the accompanying reduction in commercial real estate tax will have an effect on urban/suburban form and a negative effect on local government budgets. I agree with you. 20910 is urban and getting more so. I really would like to see the county leave some large green space for the people the pack in vertically.